Gemologist John Heusler DBA Slabs To Cabs - Jessite Agate ~ RARE! 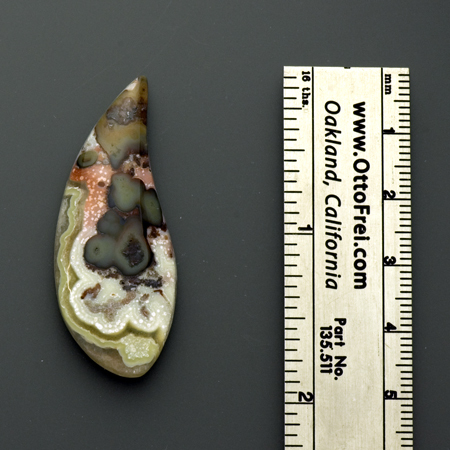 Jessite cabochon. Note the dotted pattern. 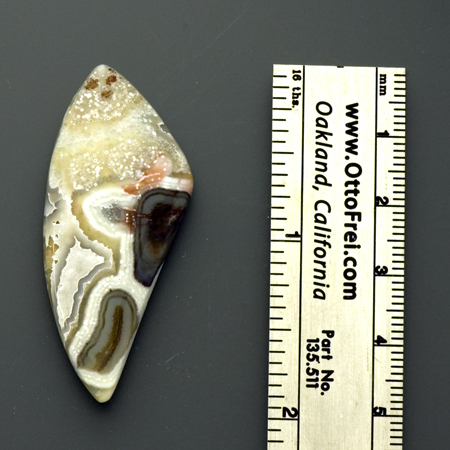 Very indicative of Jessite Agate. John F. Heusler G. G.
I named it after my lovely daughter Jessica. It is so unique that everyone that has seen it HAS TO HAVE IT! 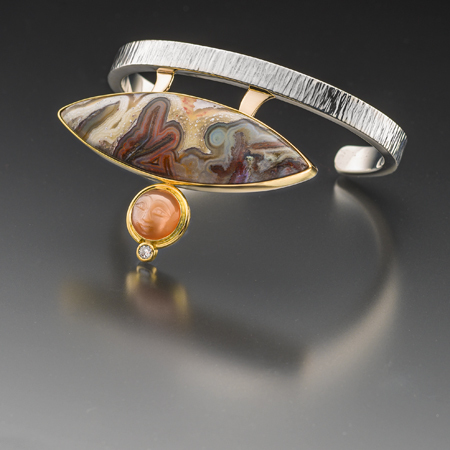 I wrote an article on it in Lapidary Journal Jewelry Artist Magazine's January February 2014 issue. It is from Mexico and I am the sole supplier of this beautiful new gem. In early January Jessite was all but common. I was worried that it was played out before I even got my second shipment. By February I had word from the mine that there was more coming out. Very little but it was a great sign. As of June 2016 we have no more than 480 total pounds that has come out of the mine. Quite rare this gem has become. At this stage I am cutting and selling only cabochons. While Jessite in scarce we have discovered the sister gem! Upon digging for Jessite we have discovered yet another gemstone. Kaily Agate. Named after my daughter Kaily. Just like her it is BEAUTIFUL!! Exact same vein Jessite is found. It seems that it goes from Jessite to Kaily Agate and back again. I hope to find both in one rock that I can cut at least two pieces including both varieties in one cab for my daughters! See my page on Kaily Agate for pix! Come see us in Quartzsite all of January at Desert Gardens and in Tucson at the Kino Gem & Mineral Show. We can be found under the name Slabs To Cabs and or John F. Heusler G. G.
Please "LIKE" my page when you visit!